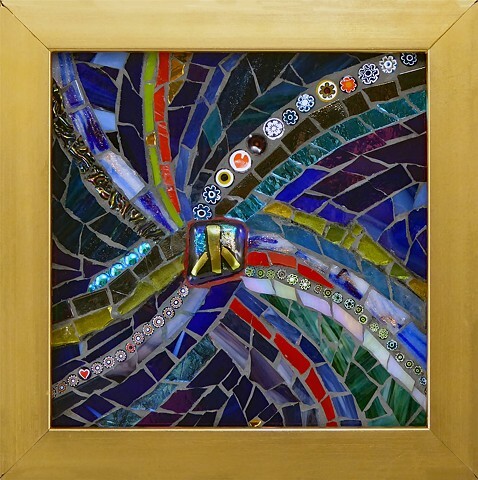 “Mosaics changed the course of my life. In one form or another art has always been a large part of my life. I grew up seeing a world filled with amazing color, beauty and artistic possibility everywhere. Many years ago while enjoying an Open Studios event in Arcata, CA. those artistic possibilities took flight. I happened upon Skye Lab in Arcata, and met Laurel Skye. Somehow only 3 miles from my home was a glittering, amazingly wild and fun world. The amount of sparkling Italian gold and glass was astonishing. Even the floors were tiled. This was the candy store I'd been searching for my entire life. I flew into this new world as quickly as possible. I started taking as many classes as I could from Laurel and others. My vision shifted and I looked at the world in a new way. I felt as though I had found a long lost friend. The challenge of putting together the personality of a work has become my beautiful world. Mosaics allow me to express the inner beauty that I see in everything around me. I find inspiration in my Humboldt County home surrounded by flowers, redwoods, ocean, lagoons, birds, and wildlife. My life allows me to express incredible depth, clarity, and emotion through the art of glass. It is such a feeling of pure happiness.